Mothers are always anxious when it comes to her babys well-being. She knows that her baby needs to sleep well all night in order for him/her to grow healthier and happier. There are always concerns that a mother has when it comes to how a diaper might help her baby sleep peacefully, all through the night. Has the diaper become too heavy after soaking up all the liquid? Is there any leakage or has the diaper absorbed all the liquid? Is the diaper soft enough for the baby? Such are the concern that drives mothers off the fence since their baby's wellbeing is their primary concern. Now, mothers can kiss their worries goodbye, since MamyPoko strives to find a permanent fix for their problems. 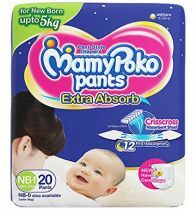 With its crisscross absorbent sheet, which has the capacity to absorb up to 7 glasses of urine whilst spreading it equally to prevent heaviness, MamyPoko Pants Extra Absorb gives your child the comfort they need. This comfort is supplemented by the diapers stretchable thigh support, which prevents gaps between the diaper and the baby's thighs, preventing leakage; hence giving the mother and the baby a peaceful and sound sleep.